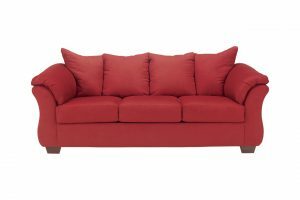 I’ve needed a new couch for a while now, so I’ve been looking around to see if there is any consensus on what are the most comfortable options generally available. I haven’t been able to find much, so I thought why not put a post together with some options for people who want to be comfortable like me. The problem with making a list of comfy couches is that what works for one person might not be the best option for the next person. So I have spent quite a bit of time researching and coming up with an extensive list that has something for everyone depending on your style, budget, and features that you may find comfortable. After going to quite a few stores and sitting on a lot of couches, I realized what I like is a reasonably soft cushion, a padded armrest and a style that is long enough that you can comfortably stretch out on it and lay down. The following list has some of the options that I tried out, and a few that come highly recommended for their comfort. Ashley Homestore had lots of couches that were really comfortable and very close to what I was looking for. The Ashley Darcy Sofa was a particular favorite for me. The fabric seems like it would be easy to clean and pretty durable. It was also very comfortable when sitting because of the cushions, and even suitable for laying down since it is a decent length. The pillows were a little bit firm yet still super comfy, and the fabric on the display model was super soft while not feeling like it would get wrecked too easily. The thing I most liked about this couch was the price; it was less than $500 but didn’t look or feel super cheap. Overall if you want a super comfortable and relatively inexpensive sofa, that is decent quality and pretty durable, Ashley Homestore has lots of different options. I have not had a chance to try out a Lovesac Sactional, but I’m intrigued by the whole concept of ordering a couch online that has a modular design so you can combine the pieces to create something exactly right for your space. Lovesac Sactionals have a reputation for being very soft and comfortable, partly due to their two layers of high-density polyurethane foam on the cushions. They aren’t the cheapest option around, but since you can buy them in pieces, you can add new parts to it and change the shape if you get bored with what you have. They are designed to retain their shape for years, which can sometimes be an issue with the comfortably cushioned type of couches. You also have the option to choose one of three different types of premium fills, depending on the model you like best. Customers of Lovesac report that the Sactionals are well-built and durable, and they also really love that you can replace the washable covers and rearrange the sections in many different ways. Lazyboy is, of course, known to make comfortable chairs, but I hadn’t considered them for somewhere to shop for a sofa until a friend mentioned that they had a great selection that was worth a look. 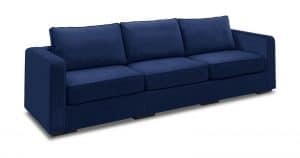 The Collin Premier Sofa is an excellent place to start if you are interested in getting a Lazyboy sofa. It is a pretty simple, basic couch that can fit in with most decor. The cushions are very comfy but feel super well made, like they can take a decent amount of wear and still hold up. It has semi-attached pillow backs, padded roll arms and box seat cushions. Lazy Boy furniture is known for being durable and well constructed and should last for quite a long time without losing shape or falling apart. Their couches aren’t cheap, but they come with a great warranty and can take a beating. I love the aesthetic of the Taraval sofa from Crate and Barrel and was surprised at how comfortable it was when I got a chance to sit on it in one of their stores. It is a beautiful sofa, that is nice and long so you can take naps on it as long as you aren’t too tall. Since it is Crate and Barrel, it’s a little pricey at around $2100, but it is excellent quality and is made by Lee Industries which is known for producing high quality, stylish sofas that will last forever. This favorite Comfort Reclining Sectional from Wayfair comes up in a few places as a comfortable option that is relatively inexpensive for a faux leather sectional. The faux leather means that you get the look of leather but without the hefty price tag. 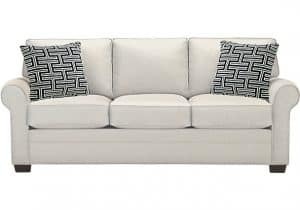 Faux leather is quite a popular choice for couch fabric since it is durable and easy to clean. 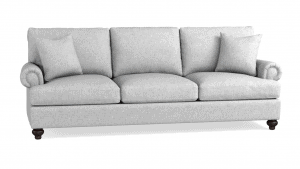 This couch has lots of features that can lead to the ultimate in comfort. It is a reclining sectional that has four recliners, that may be enough for your entire family to sit back and relax with no one fighting over who gets the recliner. The seats are a medium firmness that has a foam filling. The recliners are a manual recliner so you shouldn’t run into any trouble with them not working, or if they do stop working they should be easy to repair. It is an excellent option for a large family since there is seating for six. It also has hidden storage and, my personal favorite, a cup holder so you can relax. If you have a Rooms to Go near where you live, you may want to check out Cindy Crawford’s line of couches. They are surprisingly well designed, with beautiful fabric options. I didn’t find the prices overly expensive for what appeared to be good quality furniture. The style that I found the most beautiful and most comfortable was the Bellingham. It is a basic style that goes with anything; you can get it in 8 different colors that are all equally stylish. It comes with a couple of patterned (your choice of pattern) pillows as well. The cushions are firm yet very comfy and are all removable. If you get the fabric protection, it should be easy to keep clean. It is quite inexpensive and seems to be a decent option for the price. If you want a comfortable and long-lasting sofa, it might be a good idea to invest in a higher end brand; it may save you money in the long run if you don’t have to replace it as often. A lot of people love Ethan Allen for couches that can last for years and stay in good condition. Growing up, I came across a few Ethan Allen couches at friend’s houses that I found to be much too firm for my tastes. Because of this, I’ve had a lingering aversion to Ethan Allen furniture in general. For this post, I decided to give them another look and was a little surprised to find their couches much more comfortable than I remember them being. One of the couches that I found to be very comfy was their Maria style. Sadly, it was well beyond my budget since the starting price was $2600. 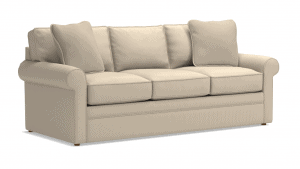 Anyway if you are looking for better quality, long-lasting sofas check out Ethan Allen. Another option if you want a higher end brand and don’t mind spending a bit of money to get it, is Bassett Sofas. They are beautiful, very well made, and they will last forever. They have a tonne of different options, but the ones that look great to me are some of their great room sofas that come in a variety of styles and fabric options. The frames and cushions come with a lifetime warranty, and the price seems to be decent for what you are getting. You can spend quite a bit if you go for add-ons and more expensive fabrics, but if you get them on sale, you may be able to snag a high-quality couch between $1200 and $1500. I wasn’t planning on putting an Ikea sofa in this post since I have never sat on an Ikea sofa and found it comfortable. However, if you have a limited budget, as a lot us do, it’s nice to have an inexpensive option that is also decent quality and is comfortable. Since a lot of people love Ikea sofas, I decided to give them another try to test out what is reportedly their most comfortable style, the Kivik. One of my issues with Ikea sofas is that I think the fabric often looks cheap and I find them to be very low to the ground, so getting off them is a little more effort than I like to exert when trying to relax. Anyway, despite my misgivings, I did test out the Kivik and was surprised to find that I liked it quite a lot. What is great about this design is it is relatively cheap for a very modern looking style, the fabric seems like it would be kid and pet-friendly and yes, it is quite comfortable. It doesn’t feel like you will get a lot of sag on the cushions, so it should maintain its shape for a long time. The other thing that I love about this couch is that you can also take off the entire cover, including the armrests, the back, and the cushions, and wash it or replace it if you need to. The armrests are also oddly low, which I think would be nice to rest stuff on. 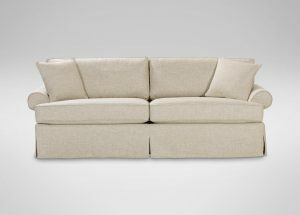 HomeReserve.com is an exciting website that offers several different styles (as well as chairs and sectionals) to choose from. You basically select your style, choose the fabric, then the couch will be shipped to you in easy to carry boxes that you move quickly around your house. You will have to do some assembly, but most people don’t find it difficult at all. 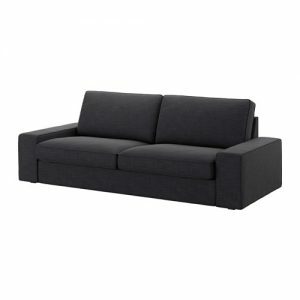 The Ray Couch looks like a comfortable, modern style that is kind of similar to the Ikea Kivik, but a bit bigger. The frame comes with a ten-year warranty and each pillow, cushion and fabric cover is washable and also easily replaceable, which makes it a great option if you have kids or pets. The Ray Couch also has built-in storage underneath the cushions. Couches come in many different types of materials. Twill, faux leather, and genuine leather are often considered the most durable, but if you are like me, you won’t find them to be the most comfortable. Linen, microfiber, velvet, cotton, and chenille are usually softer and in my opinion comfier. In my experience, the softer more natural fabrics are usually less stain resistant, so if you want something soft and stain resistant, microfiber is a good option as it is super soft, stain resistant and durable. The cushions are a crucial factor in finding a great sofa. A lot of people recommend not getting cushions that are attached to the frames since they tend to sag over time and get uncomfortable. If you get a couch with loose cushions or a solid back, you can flip them over to avoid the sagging. If you have pillows that aren’t attached, you can also remove them to get more space if you are taking a nap. There are lots of different arm styles to choose from, so if your goal is comfort you may want to check out pillow top, round or rolled arms rests, since those tend to be the most comfortable. You can probably find a reasonable quality, comfy soft for under $700, but it is very easy to pay well over $1000 or even $2000 if you are looking for a custom design. If you are looking for a genuine leather sofa expect to pay much more.